What data can I get from Button? Button helps Publishers and Merchants build partnerships to earn revenue and acquire users through a mobile marketplace. The data from Button is centered around transactions. Funnel downloads all transactions based on their creation date in Button*. See a list of the dimensions and metrics you can get from Button below. * The Button API currently does not have the capability of querying transactions based on purchase date. The ID of the button. Button generated Order ID that is globally unique. Only available for new-user-order and existing-user-order events. A Button configuration value distinguishing the Merchant Campaign ID tied to this transaction. The type of event that generated this commission. The Button organization ID for the Merchant that received the billable transaction. The Button organization name for the Merchant that received the billable transaction. The channel in which the user completed the transaction. Values include: App, Webview, unknown. Merchant reported ID in their own namespace. Only available for new-user-order and existing-user-order events and when reported by the merchant. The publisher token set when a Button or Link was fetched (only visible to the Publisher). The Button organization ID for the Publisher application that drove the transaction. The Button organization name for the Publisher application that drove the transaction. 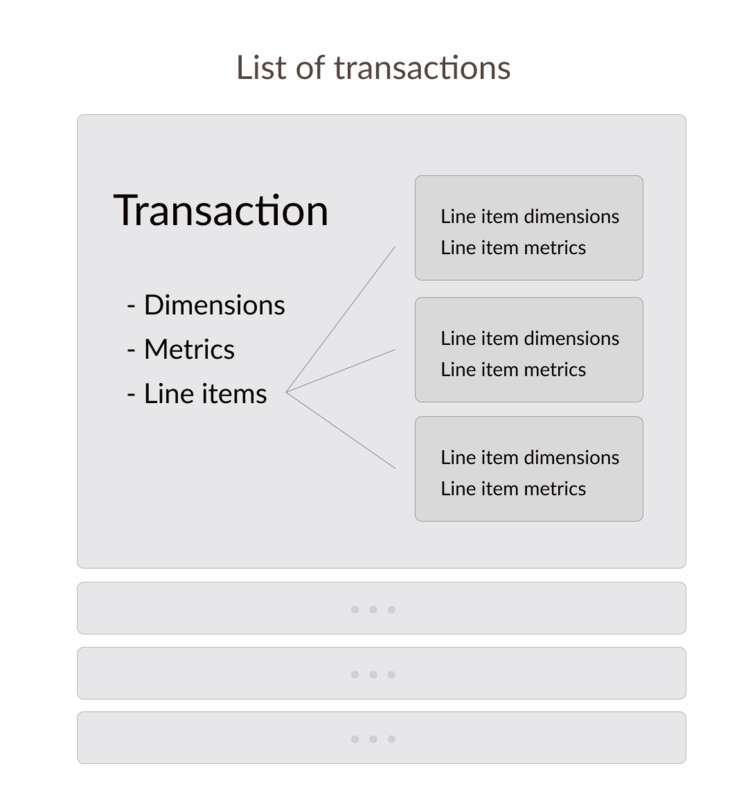 Basic metrics for the transaction. Not available on line item level. The commission your organization has earned (originally provided as positive 'Amount' in button). The total value of the order. Includes total value of all items purchased, whether or not they qualified for a commission. Includes discounts, if applied. Only available for new-user-order and existing-user-order events. Only available for line item metrics. A unique identifier for this line item, within the scope of this order. Text describing the line item. The number of individual units purchased.